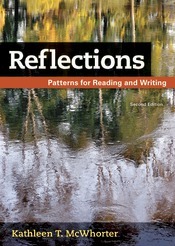 This innovative modes-based reader by reading expert Kathleen McWhorter supports an integrated approach to reading and writing with unique scaffolded instruction that guides students through comprehension, analysis, evaluation, and written response — skills students will need to be successful in college. Compelling reading selections drawn from widely taught academic disciplines let students practice the work they’re expected to do in other college courses. The second edition has been thoroughly revised with a new grammar handbook, expanded research coverage, new readings, and new features to provide stronger, more integrated reading and writing advice. Reflections can be packaged with LaunchPad Solo for Readers and Writers, allowing you to more efficiently track students’ progress with reading, writing, and grammar skills in an active learning arc that complements the book.